The topic of economic inequality can appear complex, with many nuanced causes and outcomes. But while the two of us actively engage in that debate, we also strongly believe that there is one overarching factor that must not be, but often is, overlooked: worker bargaining power. On Labor Day, this problem of the long-term decline in workers’ ability to bargain for a fair share of the growth they have helped generate deserves a closer look. There is, of course, a direct link between less worker clout and the decline in union coverage. In addition to directly empowering workers at the workplace, unions have played a central role in the drive for a wide variety of policy measures to ensure that everyone benefits from prosperity, which is the opposite outcome of rising inequality. This list includes Social Security, Medicare, paid family leave, civil rights legislation, fairer tax policy and higher minimum wages. 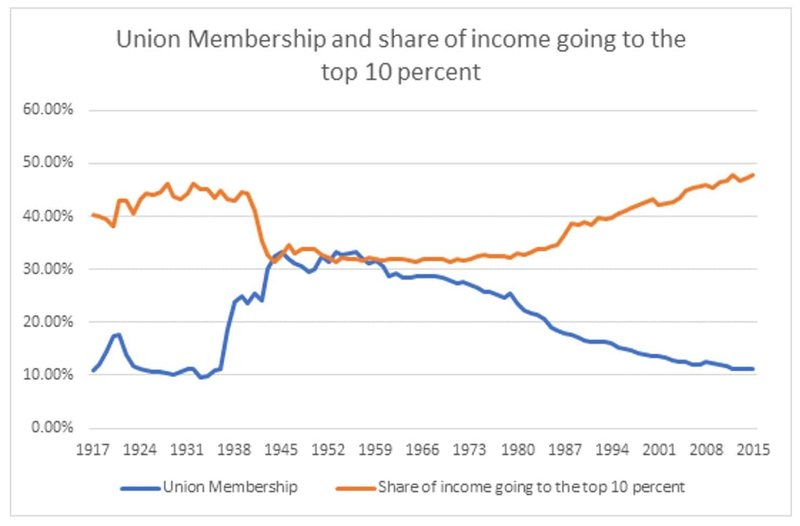 This view has been further buttressed by recent research using new data showing a strong connection between union strength and a more equal distribution of income (see figure), a link that makes the sharp decline in union membership over the past four decades particularly disturbing. This decline has not been an accident. The right has quite explicitly targeted unions with an array of anti-union policies, the most recent of which have been “right-to-work” laws. These prohibit contracts that require all the workers at a unionized workplace to share in the cost of representation. The impact of anti-union policy can be seen by the differing experiences of Canada and the United States over this period. While the unionization rate in the United States dropped from roughly 20 percent in the late 1970s to just over 10 percent most recently, unionization rates in Canada have edged down only slightly over this period and still exceed 31 percent. The fact that unions continue to thrive in a country with a very similar culture and economy indicates that there is nothing inevitable about the decline in unions in the United States. It was deliberate policy. Given that powerful, vested interests are behind the decline in unions, reversing this decline will be a serious challenge, one that requires worker-friendly policies and new forms of worker representation, such as centralized bargaining. For example, instead of organizing one restaurant at a time, unions must push for collective bargaining rights for restaurant workers across their industry. It also will require reaching out to all types of workers, not just those in construction, factories or lower-paid services. Two decades ago, we worked together at the Economic Policy Institute (EPI). EPI was and is a great place to work, but we felt it was important for the staff to gain an institutionalized voice. We helped organize a union that affiliated with the International Federation of Professional and Technical Engineers (IFPTE, Local 70). Since then, Local 70 has organized a number of Washington-based nonprofits. It now has well over 300 members. If some current organizing drives succeed, Local 70, which has since been restructured as the Nonprofit Professional Employees Union (NPEU), will have more than 500 members. We are well aware that in a labor force of more than 150 million, 500 workers isn’t exactly a game-changer. But the journey of 1,000 miles starts with one step. It is essential that unions make inroads into the types of workers organized by NPEU if they are to regain the sort of influence and power they had in prior decades. Unions will continue to be important in traditional strongholds such as manufacturing and construction. But as the workforce becomes more educated, a powerful union movement will need to include many workers with college and advanced degrees. If that sounds peculiar, in countries such as Denmark and Sweden, which have a far more equal distribution of income than the United States, more than 70 percent of the workforces are represented by unions. In these countries, it is the norm for people working in white-collar jobs, including many with college degrees, to be represented by unions. The United States may never approach Scandinavian rates of unionization, but if we are even going to get back to 1970 rates, unions will have to make inroads into new areas. Part of that story has to mean organizing professional workers. On this day in particular, we proudly recall our small contribution to this effort. True as always. However, even in places like Sweden and the rest of the everywhere, the rise of fascism has meant the division of these societies into BAD and GOOD. This has overshadowed all else to a great degree. To take Sweden as one example, there are now two Swedens! There is a Good Sweden and there is a Bad Sweden (Please watch a short documentary on this released a few hours ago). What are they divided over? The immigrants taking Swedish jobs. Which immigrants would these be? Swedish citizens? And which jobs would these be anyway? The same type of jobs that the young know they will never have, as demonstrated by riots all over Europe and elsewhere? Union bashing which was once the norm belongs to the good old days of capitalism. What we face now is something utterly different and based on solutions to take the cause of all victims further. Good luck to the most progressive of us all! Was all this predictable at least decades ago? The true answer is absolutely. What is to be done now? An alternative global school of Economics with a new global curriculum. In the new paradigm unions will be strong again because there will be options to middle class incomes other than employment only. Hence they won’t have “the reserve army of the unemployed” weakening their leverage anymore. Also, the monopoly money creating power of the private banks will be eliminated due to the fact that we will have a publicly administered national bank that not only is able to loan money at 0% interest, but also participate in the discount/rebate policy further reducing prices and increasing potential individual purchasing power. The entire philosophical thrust of business will tend toward grace as in greater prosperity and profitability for business and grace as in cooperative flow between business and employees rather than the obsessive contention we see now or even the dominance of forcing rip gut wages on the helpless populace. ….and if employers fall back into such ungracious behavior despite the many benefits Wisdomics-Gracenomics will bring them there’s always public scorn and painful sin taxation to help guide/induce them back toward grace as in humane consideration for the Other. Just how does a nation like the US “make inroads into new areas” of unionization such as organizing professional workers? One of the hearts of the US is from its beginning individualism. Each person is responsible for his or her success, including overcoming obstacles such as the enmity of wealthy and powerful interests. Early unions in the US had to endure newspaper attacks and a variety of physical violence from leaders assaulted and murdered to attacks on a broad scale from private police, real police, and the army. I take it none you involved in organizing NPEU were attacked or murdered? This tells me the battle to organize workers is now mostly ideological. In terms of neoliberalism and libertarianism, both dominant in the US for over 40 years unions are not just a bad idea, they are an un-American idea. For union success we first need to change the ideologies dominant in the US. Perhaps the 2018 elections are the beginning of that change.